Hey, there’s a bit of on-field baseball-type stuff to discuss this afternoon. I’ll take it. With Addison Russell out, Javy Baez is obviously the Cubs’ everyday starting shortstop. And among the bench options to back Baez up, you’ve got … Ben Zobrist? Daniel Descalso? Neither has played any shortstop recently, and neither really strikes you as a realistic option there outside of a relative emergency. 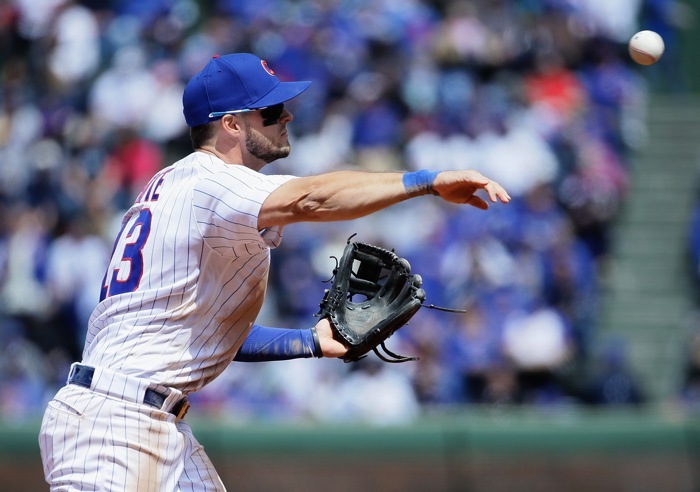 So, then, all you’ve got is Bote, who did appear in 15 games there at AAA last season, and is superlative with the glove at third base, solid at second base. I reckon he can handle a little shortstop. But I also reckon that, if there were a serious injury to Baez in the early going – GOD FORBID – the Cubs might dip into their collection of AAA’ers to fill the void. 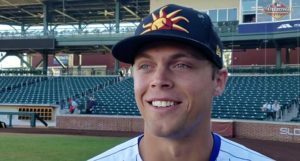 Among the guys expected to be at AAA/AA who can play shortstop: Trent Giambrone, Zack Short, Cristhian Adames, and Ryan Court. Then again, if Bote shows he can be more than merely passable at shortstop, maybe he’d get a longer look there if the bat was clicking. 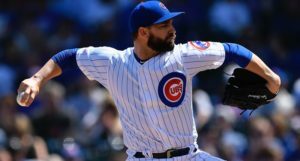 Also, of note: once Russell returns in early May, if everyone is healthy, Bote might be squeezed out of a bench job. Assuming the Cubs carry eight relievers (they will), there are just four bench spots. With Russell at short and Baez and second on a typical day, one bench spot will go to the back-up catcher, one will go to whichever of Ian Happ/Albert Almora you don’t consider the starter, one will go to Ben Zobrist, and one will go to Daniel Descalso. Now, onto the second base comment from Maddon. Obviously Daniel Descalso is going to see plenty of time there, especially when Baez is manning shortstop. Whether he should primarily face righties or lefties, though, is a more delicate point, given his huge reverse split last year when he kinda broke out – 134 wRC+ versus lefties, 107 versus righties. He’s 88/84 for his career, so more split-neutral, but you don’t want to take away whatever it was that had him raking against lefties last season. As for Ian Happ being in the mix at second base, that would be something of a surprise. Even if you set aside the over-abundance of options the Cubs will have there, I’m not sure the Cubs actually view Happ as a playable second baseman at this point. After working him there in the offseason a couple years ago, and then giving him some looks in 2017, the Cubs almost entirely abandoned the idea of having Happ play at second base last year. So it would be a surprise to see him pop back up there now for meaningful innings. I think it’s far more likely he pitches in at third base if necessary, but is otherwise an outfielder. I’d almost rather see him focus on improving his outfield defense at this point. He’s got the athleticism to be very good out there.